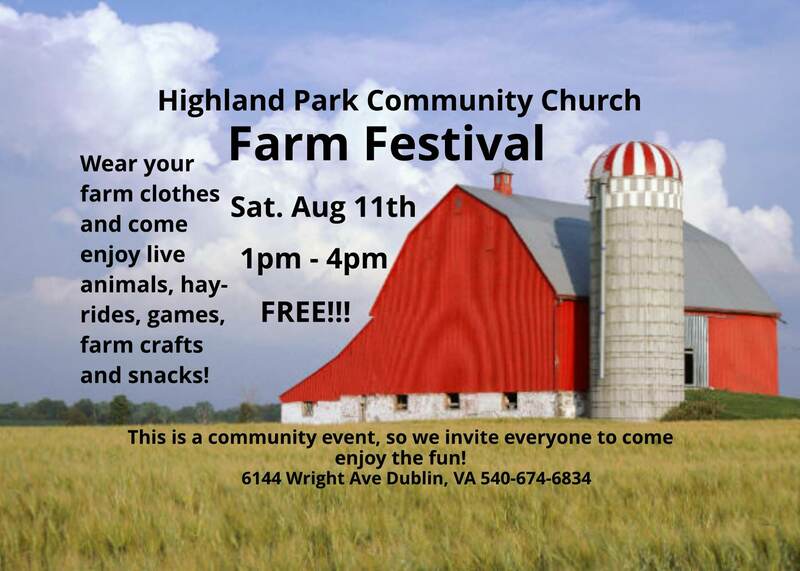 Highland Park Community Church presents their 2018 Farm Festival on Saturday, August 11, 2018. Our Farm Festival is a fun, free family event! Wear your farm clothes and enjoy live animals, hayrides, games, prizes, farm crafts and snacks! This is a community event and admission is free. We invite everyone to enjoy the fun! To view the event flyer, visit: https://i.imgur.com/CdRY1cf.jpg. Highland Park Community Church is located at 6144 Wright Avenue in Dublin, Virginia. For more information, visit: https://www.facebook.com/events/695269007483543/ or https://www.facebook.com/Highland-Park-Community-Church-391082247677669 or http://www.hpcc-dublin.com/ or call 540-674-6834.